The Royal Institute of British Architects (RIBA) and the Woodland Trust are delighted to announce the winner of the open design competition for a new Visitor Hub at Langley Vale Wood in Surrey as Mark Wray Architects from Bath. Langley Vale is a 640 acre site in Surrey on the edge of the M25 and near the town of Epsom. The land has been chosen as the location of England’s First World War Centenary Wood. The Trust intends to protect and manage the existing mosaic of habitats, including ancient woodland and open grassland. The WT also plans to plant 200,000 native broadleaf trees at the site, to commemorate the efforts of all those involved in the First World War. 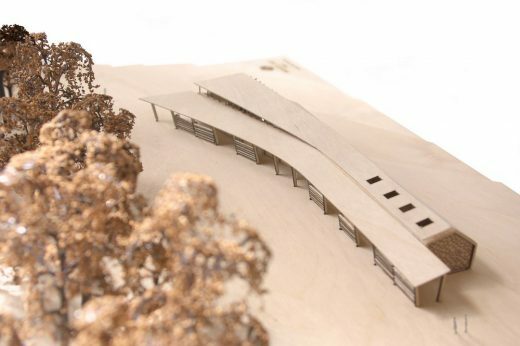 The new Visitor Hub will provide amenities for visitors and create a welcoming and exciting connection to the woodland. The hub will enable visitors to dwell on site and raise the profile of Langley Vale Wood as a destination for local residents, day visitors and volunteers. The design by Mark Wray Architects was felt to have responded most effectively to the site and to the Woodland Trust. The panel felt it was an imaginative and beautiful scheme which would demonstrate well how mankind and nature can co-exist. The other two shortlisted schemes came from MORE design, London and Studio Octopi, London. The Woodland Trust will now work closely with the winning team to develop their design and submit a planning application. The Woodland Trust is the UK’s leading charity championing native woods and trees. It has three key aims: i) plant native trees and woods with the aim of creating resilient landscapes for people and wildlife ii) protect ancient woodland which is rare, unique and irreplaceable iii) restoration of damaged ancient woodland, bringing precious pieces of our natural history back to life. Established in 1972, the Woodland Trust now has over 1,000 sites in its care. Access to its woods is free. The First World War Centenary Woods project was started in 2014, and seeks to commemorate the conflict by creating a living legacy that can grow and thrive for future generations. Langley Vale is the Trust’s 640 acre flagship site for England, and will be planted with tens of thousands of native trees and carpets of wildflowers. This project offers everyone the chance to dedicate trees in memory of their ancestors, while schools and community groups can apply for free tree packs to create their own woodland. The First World War Centenary Woods project is supported by the Trust’s lead partner Sainsbury’s. The Royal Institute of British Architects (RIBA) is pleased to announce the launch of an open design competition in partnership with The Woodland Trust. The competition is seeking designs for a new Visitor Hub to facilitate visitors on site at Langley Vale Wood supporting 180,000 visits per annum. Langley Vale is a circa 640 Acre Site in Surrey on the edge of the M25, of which circa 140 acres is existing, mainly ancient woodland. The site has been identified as England’s First World War Centenary Wood for the WT’s First World War Centenary Woods project. The intention of the project is to protect and manage the existing woodland and create new native broadleaf woodland on the site. The area provides a living tribute to those affected by the First World War and will encourage people to get outdoors and enjoy the natural world. The Client is seeking registered architects, designers and landscape architects, (students of these disciplines may also apply) based in the UK, that can bring innovative and imaginative thinking to the Visitor Hub. 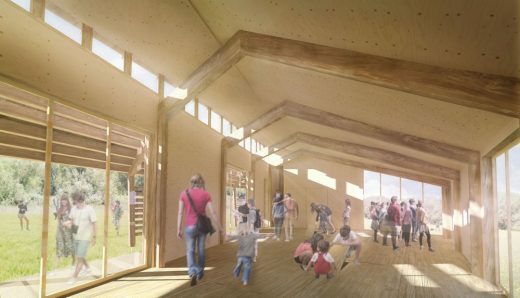 Providing amenities for visitors and creating a welcoming and exciting connection to the woodland, the circa 300sqm hub will allow visitors to dwell on site and raise the profile of Langley Vale Wood as a destination for local residents, day visitors and volunteers. The Judging panel includes Sarah Wigglesworth, Sarah Wigglesworth Architects, as the RIBA Adviser. “Langley Vale Wood, England’s Centenary Wood, will be the site of our very first visitor hub in England. We are very excited to invite architects to help us design a unique building in fitting with a growing landscape. The winning design will help us welcome thousands of visitors each year to experience and enjoy native broadleaf woodland” commented Philippa Borrill Project Development Manager, Woodland Trust. The initial phase of the competition will require teams to submit designs anonymously, in digital format only. Three concept designs will then be shortlisted for further development at the second phase. Each shortlisted designer will receive an honorarium of £3,000 + VAT. The closing date for First stage entries is Wednesday 27 January 2016.